Though it might surprise you, there’s a connection between your thyroid health and consuming gluten! I’ve talked about the connection of gluten to other hormonal areas such as the adrenals, but the thyroid can also be affected. That’s why I sat down with Thyroid expert and natural food chef (as well as author, speaker and TV host) Andrea Beaman to talk about this topic. She shares her own inspiring story to make changes to her diet which naturally re-balanced her thyroid levels as well as what you can do RIGHT NOW to help yourself. You’ll also learn why gluten needs to be a real concern for you if you have thyroid issues. Trust me, this information is incredibly valuable and powerful! 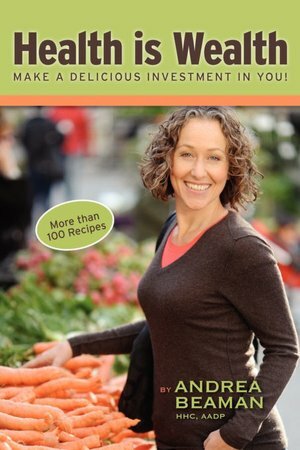 If you’d like to learn more about Andrea, visit her website for some awesome recipes & videos or purchase her new book “Health is Wealth”. For more information on how you can balance your thyroid and hormones, click HERE. Hi Matt, thanks for commenting…let’s see what Andrea has to say…I’m not sure on that one. What I can say is that if you’re sensitive to gluten, then you can have a reaction regardless of your thyroid situation. But of course, it all depends on your particular situation. Great question! Hi Matt – Although gluten can be a problem for many folks, it’s not necessarily a problem for everyone. I agree with Jennifer, that if you are sensitive to gluten you can have a reaction regardless of whether or not you have a thyroid. You mentioned “cleansing.” Cleansing is great, but it can strip the intestines if done too often. Maybe try “building” instead of cleansing. Homemade stocks (fish, chicken) work well to help build up internal strength.